And just like that, it’s done. 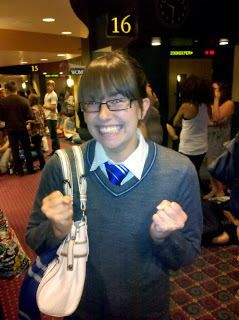 Last night was the final midnight premiere of anything Harry Potter. And while Harry Potter and the Deathly Hallows Part 2 was very, very good, I can’t help but feeling a little…blue. 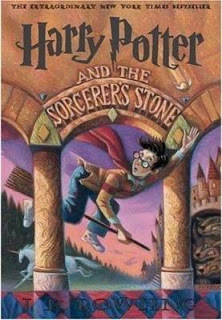 My love affair with Harry goes back to when Sorcerer’s Stone was first released. It was 1998 and I was 12 years old. My mom had brought the book home on a recommendation from a friend and meant it to be for my brother or sister (seven and nine, respectively). However, as soon as she mentioned that it was about wizards, I snatched it up and devoured it in days. And so the obsession began. I essentially grew up with Harry, anxiously awaiting the release of each book and attending midnight release parties when they came in vogue. I would re-read each installment until the bindings started to wear, pretty much lived on Mugglenet, and basically drove my family nuts with my incessant gushing about the series. The first movie was released when I was a sophomore in high school, and fortunately I had friends who were just as excited as I was. They weren’t doing midnight releases then, so we popped into the first showing we could that Friday night. We brought Bertie Bots Every Flavor Beans, Chocolate Frogs, stuffed owls, plastic Potter glasses and had the time of our lives. Before I knew it I was buying robes and house sweaters to complete my nerd-tastic ensemble. Now here I am at 25 and all that excitement, all that anticipation is gone. There’s nothing new to look forward to. I’ll never be in a midnight release line again. And while it may seem completely melodramatic, that’s rather disappointing for me. Just look how excited queues make me! Trust me, the final installment was really very good. You should definitely see it. I’m definitely going to see this movie about eight more times in theatres (and don’t you dare think I’m retiring my Ravenclaw house uniform) but it’s just a very odd feeling to now look back on Harry Potter with nothing but nostalgia.But, as they say, all good things must come to an end. To Harry Potter, the boy who lived.